Meg Heckman is a former reporter who focuses heavily on digital and hyper-local coverage. Since joining the newsroom in 2002 she’s covered city hall, the New Hampshire State House and two presidential primaries. 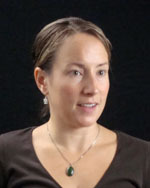 Meg attended the University of New Hampshire and has completed fellowships with the Poynter Institute for Media Studies and the New York Times Foundation. She is the co-author of We Went to War: New Hampshire Remembers WWII and has been honored by state and regional press associations. Meg is also the fingers behind @ConMonitorNews. When she’s not at work, Meg enjoys running, practicing yoga and skiing. She lives in Concord with her husband, Brian, and their dog, Radar. Meg Heckman was writing her first “hard news” story for her college newspaper when she discovered how accurate reporting could suppress hearsay and rumors in a small community.